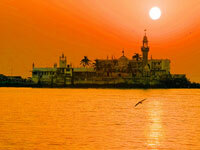 The Haji Ali Dargah is both a mosque and a tomb, located in southwestern Mumbai, on an islet off the coast of Worli. The dargah (tomb) was built in memory of Muslim preacher Syed Peer Haji Ali Shah Bukhari in 1431, who was inspired to change the course of his life after embarking on the Hajj to Mecca. Haji Ali is only accessible by a 1500-foot (457m) walkway during low tide. The walkway is generally lined with beggars and vendors, and Thursdays and Fridays see thousands of pilgrims flocking to Haji Ali to receive blessings from the dead saint. People of all religions are welcomed but the mosque is an important spiritual site for Muslims and some respect is due from visitors, who must abide by the mosque's rules - for instance, dress appropriately and use the separate entrances designated for women and men. As with many big attractions in Mumbai the site can get uncomfortably crowded and can be rather dirty, with beggars, touts and salesmen of all kinds thronging the place. The best time to visit is at low tide, early in the morning, as it is less crowded and the high tide washes away some of the rubbish. Although some people lament the crowds and dirt the Haji Ali Dargah is still a powerful and captivating site which impresses many.